The MJC (SA) Department of Quranic Affairs hosted an Ulama delegation from the Al Noor Madressa for the Blind from Pietermaritzburg. Madrassa Al Noor is one of the foremost and accomplished specialist Islamic institution for the visually impaired and hosts students from all corners of the world. Their visit included a radio interview on Radio Voice of the Cape, Jumuah lectures performed by students of Al Noor Madrassa at Masjidur Rawbie in Mitchell’s Plain and Darul Islam Masjid in Surrey Estate, as well as a live Fajr Salaah program Addison Street Masjid in Salt River. On Thursday, 09 March 2017, they had a sitting with the DQA Board of Advisors. On Friday morning 10 March 2017 the delegation visited Jameyyatul Qurra Hafith Institute, they also visited world-renowned reciter Qari Saleem Gaibie, who is a board member of the DQA and the Director of Al Tanzeel Institution in Kenwyn. 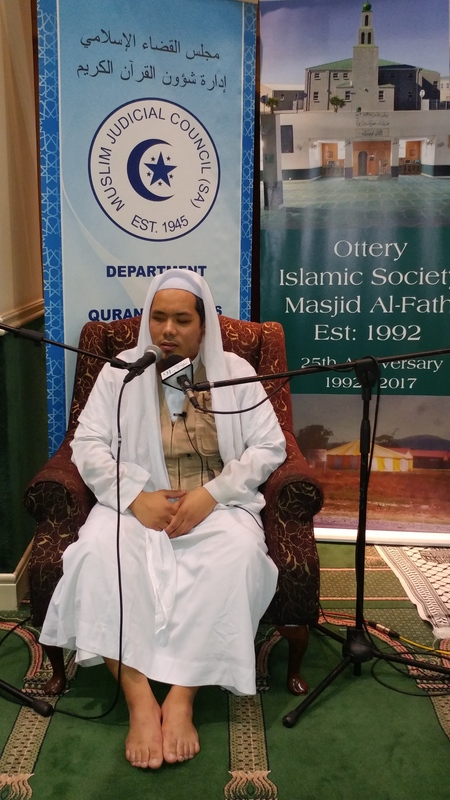 On Friday 10 March, at Masjidul Fath in Ottery, the students of Al-Noor captivated the Muslim community with their quranic renditions at a specially arranged Qira-ah program. Al-Noor graduate, Sh. Islaah from Thailand, who also completed his qualification in the Asharah Qiraa-aat or the ten dialects of Quranic recitation, performed a practical demonstration of the various dialects in his recitation. The delegation captivated the audience with their wonderful recitations of the Quran and the Islamic knowledge. The uniqueness of the Madressa Al-Noor for the Blind that they utilize Braille as a medium of teaching. Previously the school relied on importing braille texts to teach students but today they’ve developed their own printing and translation facility to the extent that they now export braille material to other parts of the world. The Muslim Judicial Council (SA) is proud to be associated with Al-Noor Madrassa and prays that the Almighty continue to bless the institution and all those who unselfishly sacrifice for its further development.